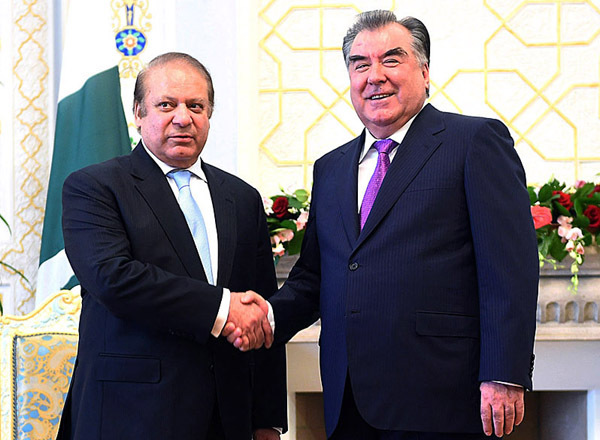 Sharif and Tajik President Emomali Rahmon on Wednesday held one-on-one meeting here and stressed close collaboration between the two countries in trade, energy and defence sectors. emphasized on tapping the opportunity to translate their close political ties into strategic cooperation. satisfaction that Pakistan and Tajikistan were celebrating 25 years of their friendship. support extended to Pakistan in getting membership of Shanghai Cooperation Organization (SCO). development and progress achieved under President Rahmon’s leadership. and Tajikistan in diverse fields and stressed increase of bilateral trade volume upto Rs 500 million. 2015 besides a Business Forum in 2017.
electricity project which would increase regional cooperation. regional connectivity and highlighted that the Traffic Transit agreement of Tajikistan with Pakistan, Kyrgyzstan and Kazakhstan would be beneficial in this regard. terrorism and extremism and mentioned that Raddul Fasaad and Zarb-e-Azb were launched as counter-terror operations. of Kashmir with India through peaceful means. agriculture, industry, education and culture. delegation-level meeting at the presidential palace.